Time and seasons…they also change fast, don’t they? After this, the hydrangea will bloom, isn’t it? I have to watch my health!!! The first day of the summer tour will be in the Meiji Jingu Stadium. On the 14th, there was an additional private handshake event because of my absence during the stage play. I was able to meet them all. I was happy there we also many people who came to meet me for the first time! From silly things to serious topics, I was able to talk a lot. By the way, I went eating Yakiniku with my mother who I hadn’t seen in a long time. there are also fans who told me how they spend or spent Mother’s Day, which made me feel warm. Because this time there were three rounds, time flew by. Thank you very much for the enjoyable and exciting time we spent together!!! I love you all very very very much! To the fans that couldn’t come. During round 1, I wore a striped top, and my hair was styled sotohane. During round 2, I wore a MA-1 jacket and my hair was curly. During round 3, I wore a off-shoulder top and my hair was curly. I told you by mail, but the other day my older sister, my mother and I went to Hitachi Seaside Park!!! 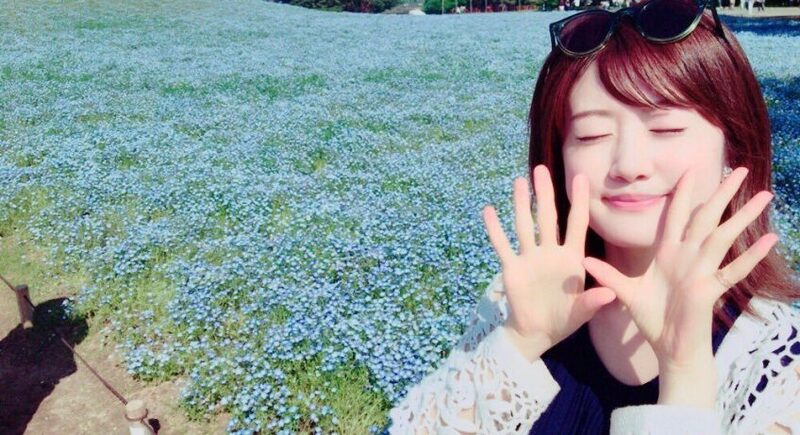 We saw the Nemophila fields that were arranged until the 14th. I couldn’t describe the beauty of it. I could look at it forever…. At the plaza, we ate lunch. Sorry to everyone I missed this time! Please do so again next year! The birthdays are limited to those I receive in the comments. It’s one of the things I can do in return for my fans that always support me.